I wasn't even aware Fennessy Lofts had started delivering. I drive by it occassionally and had never noticed anything other than a construction site. After checking the District's real property sales database, I don't find any sales recorded for it. Yet they're already offering $45,000 off selected units. I give them credit for one thing - they're not doing a Sonata. How are they NOT doing a Sonata? They are calling it a close out sale. That seems like the same thing as the Sonata to me. This is not an uncommon practice. 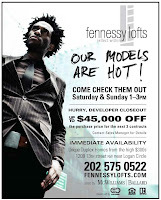 Fennessey Lofts is right down the street from me and when I visited last month the agent mentioned that something like 18 of the units were under contract. The units in the back (a converted carriage house) seemed to be especially popular. I did have a concern that they were located directly above a parking garage. The 2 br units facing 13th Street were a bit cramped and didn't seem worth the 450k+ they were asking for. Unlike Sonata, none of the units have closed - if I trust the District's records - so no one _living_ in the building is having the value of their condo undercut by the developer. They are delivering and units have closed. Part of the problem is the DC database. If you go to the Recorder of Deeds online records search, search deeds in square 0281, then sort by date, you will see they started delivering in February. It seems like neither the condo site or your homes site show any data for home/condo sales in 20009, west of 18th st in the kalorama triangle. Is this an error or is no data in the past 12 months available? I live in 1225 lofts just down the street. There was a nearly disastrous fire at the construction site a few months back in the alley, and the outside of the units in the back of the building are still visibly scortched and burned. One wonders when and whether they will fix those units. * If I can't get the condo's unit number, I don't display it on the site. * If you're looking on the west side of Conn Ave, e.g., 2120 Wyoming, that's 20008. Thanks for the pointer on the PHP error, I've contacted my web site provider. Yeah, there's bug when the search is done by zip code. I'll contact my web site provider. If you're interested in Kalorama, you can use the neighborhood search instead. Selecting 'Kalorama' shows quite a few sales west of 18th St NW. On second thought, there is no bug. The site displays 100 units at a time. When you search on '20009' for the past 12 months, more than 200 units appear. The condos you want are not in the first 100. If you select the "next 100" link on the upper right side of the map, the condos you're interested will appear. Yes, people have been moving in since February, and many of us aren't very happy with our experience so far. Ellis Denning’s principals, including Rich Ward II and Marc Weller have recently purchased units at Fennessy at prices higher than the last list price: 101, 202, 206, 806 (in May 2008 and July 2008). How strange and what does it mean? Over at Logan Row, Eileen Fennessy Weller bought two units in May 2008 (Marc Weller may have bought another in Nov 2006), Ward bought a unit in July 2008. Also note that there were some recent mechanics liens. Prices are dropping and people are ranting. Did Ellis and Denning partners break up? Can anyone help me find a working website or contact information for this project? The www.fennessylofts.com website does not work. I tried to contact the sames team supposedly selling the units and they claim that they are no longer or never were selling them. I can't get any information about this project. Why do they say such stupid things?